Do you ever experience having a trouble in taking a proper balanced diet which is healthy too? You are not alone, many of us face this difficulty and in the end we are left with wrong eating habits and a bad health. This can be one of your best friends as it has all the qualities to make you happy healthily. Low in calories and rich in protein, fiber, vitamins A, C, E and K, antioxidant, thiamin, vitamin B6, folate, calcium, iron, magnesium, phosphorus, potassium, copper, and manganese. Certainly we know spinach is good for us, but it can be a bit tough to incorporate it into our diet. That’s where Pansari Spinach Powder comes to complete your menu without any hassle. 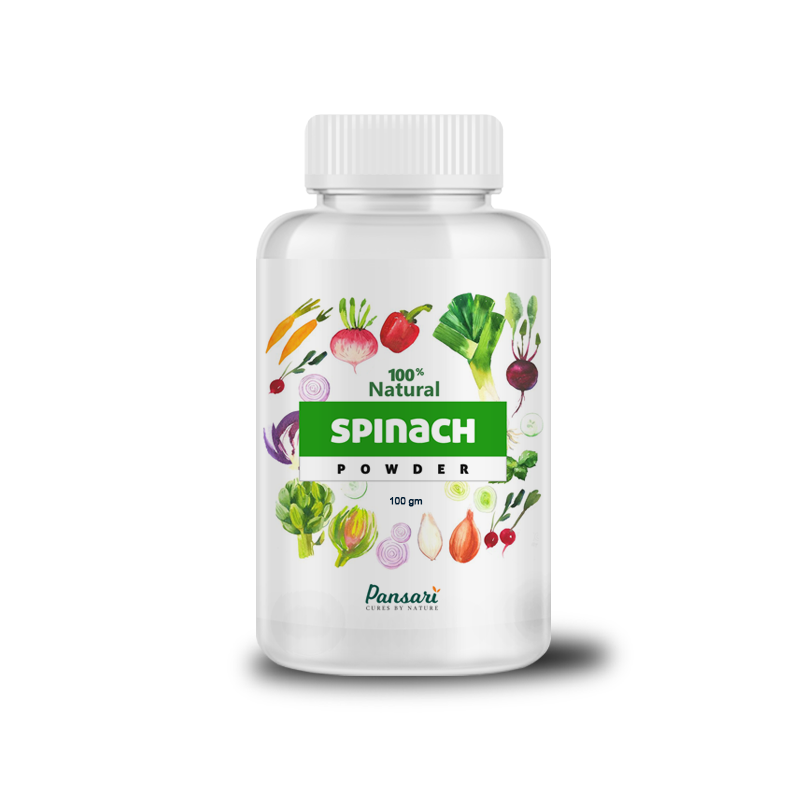 What is Pansari Spinach Powder? It’s Organic, 100% pure spinach in powder form. Why Use Pansari Spinach Powder and not the Fresh Spinach? It can be used as a supplement option. Spinach powder is an excellent substitute to raw spinach. It’s a lot easier to add it to your meals, especially if you are a 9 to 5 person. There’s almost no prep work required. You don’t have to wash this spinach or dry and chop it afterward. Pansari Spinach Powder is prepared under strict observation and quality standards with its full potency in our stores for up to several days. We do not use any kinds of artificial flavors or preservatives whatsoever. That means no more wilting spinach in your fridge, wasting both your food and the money you carefully spend on organic produce. We don’t add any colors, flavors, nutrients or preservatives to make this seem like real spinach, it is real spinach, with all original nutrients, colors and flavors intact. 1 tsp of it can be consumed with water if you do not wish to add it to any foods you like. Mix into the foods you’re already eating to instantly boost their nutrition value. Three favorite spinach mix-ins are chili, hummus and tomato juice. You can add this to the dough while kneading for chapatis and can enjoy an awesome flavor along with complete health in each bite. You can add this wondrous powder to pastas, salads and pizzas too. The product is all yours; there are limitations to your creativity. You can add it to all foods as desired. Does the dehydration process of the spinach degrade nutrient quality, too? No, not our method. We do not follow the high-heat techniques of the past and have created a unique method that evaporates water molecules using natural light. That’s because of the technique we are following, the nutrients are locked in at the moment of dehydration and stay that way for years. If still there is any confusion and you feel lost about the usage of Pansari Spinach Powder, contact us on our given mediums and one of our representative will be there to assist and guide you thoroughly.